A new hybrid lens that combines features of insect and human eyes could lead to smartphone cameras that rival the photo quality of digital cameras, and to surgical imaging to see inside the human body like never before. The lens shows a wide view, but still offers a sense of human-like depth perception: as close objects come into focus, faraway objects look blurry. "Our eye can change focus. 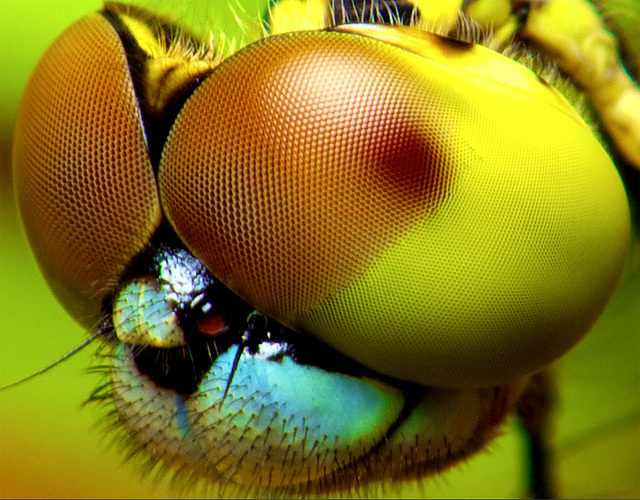 An insect eye is made of many small optical components that can't change focus but give a wide view. We can combine the two," said Yi Zhao, associate professor of biomedical engineering and ophthalmology at Ohio State University. "What we get is a wide-angle lens with depth of field." The prototype lens is made of a flexible transparent polymer filled with a gelatinous fluid similar to fluid inside the human eye. It's a composite of several separate dome-shaped fluid pockets, with small domes sitting atop one larger dome. Each dome is adjustable, so that as fluid is pumped into and out of the lens, different parts of it expand and contract to change the overall shape — and thus, the direction and focus — of the lens. This shape-changing strategy is somewhat similar to the way muscles in the human eye change the shape of the lens tissue in order to focus. It differs sharply from the way typical cameras and microscopes focus, which involves moving separate lenses along the line of sight. The shape-changing lens could potentially offer the same focusing capability as multiple moving lenses in a single stationary lens, which would make for smaller and lighter cameras and microscopes. Zhao is interested in using the lens in confocal microscopes, which create 3D images of tiny objects.